The Daily Gaggle: Words title this week is "THE BOARDING PARTY". Words to be used are Transparent. Solve. Theory. Loot. Take Wing. Demonstrate. Graduate.
. It was on the wedding day, of Princess Elisabeth and Prince Phillip, November 20 - 1947, When at around 9AM Myself and hundreds of another navy men were leaving Portsmouth England for the Mediterranean aboard HMS Illustrious an Aircraft Carrier. There was no transparent theory other than we were expected to solve the problem of replacing the time expired Navy personnel on several different ships serving in the Mediterranean. Ten days later I joined HMS Mauritius at Valletta in Malta. Then less than 24 hours later myself and others about 20 in all and All about my size and age, were sent to a training barracks where a very large but amicable Royal Marine Sergeant enlightened us to why we were here. The sergeant explained he would take us under his wing for the next two weeks and there would be no drinking or smoking and any loot like tobacco or booze would be confiscated; and when you leave here you will be the fittest guys on your ship, maybe some of you will resist but in the end you will benefit. We went through a gruelling programme of physical fitness and instruction on how to use batons and pistols. and were suitably dressed for the occasion with boots and gaiters plus shin and arm pads, not forgetting the leather backed helmet and the necessary cricket box to protect our manhood. We looked and were a tough bunch and Our training served us well, however never was there an occasion where we had to use force it seemed our presence was enough. Plus onboarding we were given packets of cigarettes to hand out to the unfortunate people aboard these boats and ships; who came to realise we had a job to do. 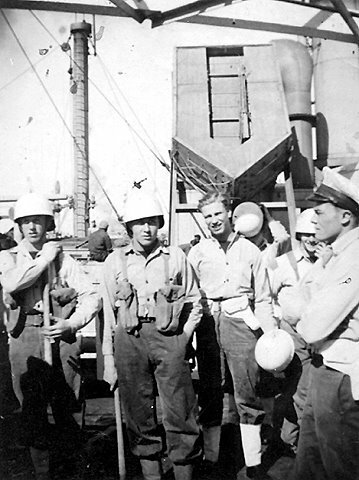 After boarding several vessels including the Pan Crescent with 7,000 souls We finally and thankfully left Haifa on May 14 -1948 amid small arms fire when the ship HMS Mauritius sailed for England. That's very interesting about delaying settlers to Palestine. Now it is tolerated that mass migration happens regardless of the consequences to those migrating. E C> Paddy Slavin was six months younger than i. I must have been a bully. But then he was much larger than I. An interesting story Dad. I found a photo and added it to your post too. Thanks Chris; No 1 son. Andrew. Palestine was a dreadful mess and still has major lineage and religious problems too. Before. and after independence, there was the Stern gang the Haggana Ben Gurian's mob the Arabs and the Brits in the sandwich with very few friends. it was the nicest place to leave in a hurry. Anon Lady. so you have been dissecting my efforts to write a simple pleasing yarn within a short space of time. yes, it does help when one has an honest functioning brain and a sometimes lurid and unforgettable collection of experiences. Reading between the lines of your comment suggest possibly there may not be a complete honesty factor within some of the stuff as you call it but I am assuming it is not coming from my miserable efforts to write an original yarn. Thanks for calling. I wonder what the previous caller was thinking, oh no not the dreaded P.